Even though we can't see the face of our quiz bird we can tell that it's bulky and neckless, just right for an owl of some kind. The fine streaking on the underparts eliminates Great Horned, Northern Hawk, Snowy, and Burrowing Owls, all of which have barring on the underparts. Barred Owl is streaked on the belly but has barring on the breast which our bird lacks. An Eastern Screech Owl would have whiter underparts. Also, I don't think we'd see an Eastern Screech Owl sitting on an irrigation device out in the open during the day! The underparts of Long-eared, Boreal, Northern Saw-whet, and Great Gray Owls are streaked but the streaking is thicker, and the streaks on Long-eared Owls have some barring mixed in. Barn Owl lacks streaking or barring on the underparts and has longer legs. 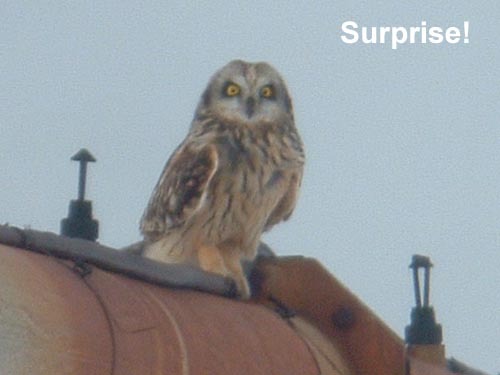 By elimination that leaves Short-eared Owl which is what this bird is. 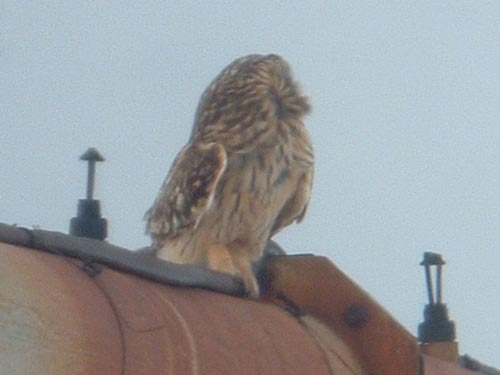 This Short-eared Owl was photographed at the Kankakee Sands in Newton County, Indiana on February 8, 2004.